"In May 1937, as a result of some work undertaken by the municipality in connection with the streets, a drain, paved with large basalt blocks, was discovered in the immediate neighbourhood of the bridge. Permission was obtained to make a trial excavation and street pavement of the period of Justinian, covered by a medieval road, was found only a few feet below the modern level. This pavement was bounded by a heavy wall, 2.10 m. thick, composed of very large blocks, It was exactly parallel to the axis of the present bridge and if extended, would have covered the sidewalk on the left (south) side of the bridge. A still heavier wall, 2.35m. thick and coming from the east, formed an obtuse angle with the first wall and is, in all probability, the fortification wall of the city of that period. It was not possible to establish the presence of a gate in the area uncovered by the trench, but it is almost certain that there must have been one at or near the bridge, which is modern in its upper part, but ancient below, is at least as old as the sixth century and in all probability very much older." 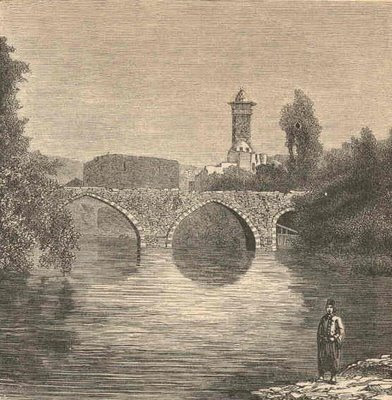 Alas the bridge referred to (pictured above in 1872) fell victim to "urban improvement" in the 1960s. So a structure that had withstood maybe 2000 years of earthquakes and wars was replaced by a jerrybuilt structure that will probably succumb to the next "Big One" when it hits Antakya. 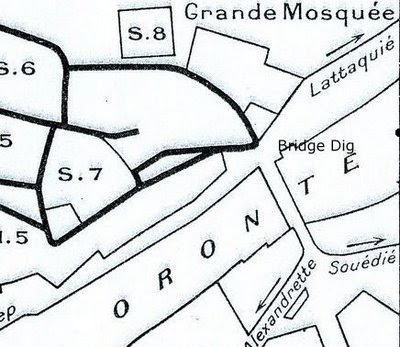 Below is a map (Weulersse's from the 1930s) of the site of the Bridge Dig. I already had divined that there had been a brief bridge excavation, from the Princeton photo archive where the still unpublished photos of this minor dig are listed. While small-scale, it fascinates me because it may be the first clue on the scale of the Seleucid Wall, for which no other parts have been uncovered. It also is intriguing because the find (at the river bank) was "several feet" below the modern surface while a mere couple of hundred metres away the dig at the Nejjar mosque had 11 metres of overburden. This reinforces my suspicion that the Greek city was originally much flatter than the current town and that descending material from the mountain and the accumulation of debris from 2000 years of occupation has created a sloping urban landscape. If the street level at the riverside is pretty much around where it has always been then that implies also that the ruins of the Greek city around this area should be quite near the surface. Amongst these ruins would be the Seleucid agora, which we have seen mentioned as being near the river, and the Shrine of Tyche which was apparently also near the riverbank. The photo above shows a view from the west side of the river towards the old town in the 1930s. The dig was at the far end of the bridge. The site of the 1937 finds now lies under what is probably the busiest intersection in the city where all the traffic flows from the old town to the new town across the river, with the implication that it would be unlikely that any extensive excavations are likely in the short-term without major disruption, despite the ruins being so close to the surface. It would be fascinating to get an actual plan of the dig and eventually see the photos thereof. Delving into the realms of the really obscure we stumbled upon an article titled Antiochenisches Kunst in the Italian journal Oriens Christianus of 1902. This article was written by the influential, if controversial, art critic Josef Strzygowski, a leading light in his time. We don't know enough of his work to comment and certainly whatever his bias was it didn't come through in this article about the very prosaic subject of two columns that stand in the Piazza San Marco in Venice. 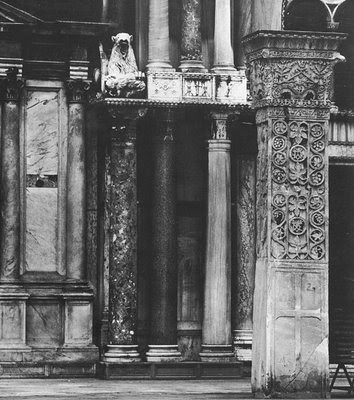 These columns are known as the Pilastri Accitani as they were looted in the 12th century from Acre by Venetian Crusaders. Strzygowski zeros in on these columns because they are examples in his view of late antique Antiochene artistry. They are indeed splendid creations. We reproduce a photograph of one of them here. His focus, beyond the elaborate decoration, is on the sculptor's seal/monogram on the column. This seal can be seen in the middle section of the column in the central panel with two examples. In his opinion, this elaborate little symbol is a combination of the consonants, N,T & X and represents a sign to the observer in the age when it was created (originally for the church of Saint Saba in Acre) that the artisan was from Antioch. The rest of the seal's details elucidate the identity of the long-lost stone worker who carved the column(s). We include this detail here because, somehow, somewhere, at some moment, some decent example(s) of Antiochene sculpture will be brought to daylight and when this occurs, the appearance of a similar symbol somewhere on the work will give away that this too was a work from a master craftsmen from ancient Antioch. Alypos, Perseus’ son, to those who live in Daphne I have given as an inheritance to watch the race games that according to custom are held in the circus. Dr. William Smith's Dictionary of the Bible Comprising Its Antiquities, Biography, Geography, and Natural History By William George Smith, Horatio Balch Hackett, Ezra Abbot: " "
This site does not derive from my enthusiasm alone. Two developments have helped lift my sources from the merely mundane and accessible offerings in local libraries. These two developments are the creation of Google Books and JSTOR, two offspring (like this blog itself) of the internet revolution. However, one result of the vast opening of hidden resources is that true gems are found that would never have appeared in a decade of scholarship in the 1960s. The indexing power of the two new tools is as important as the information indexed itself. It permits a serendipitous wandering which throws up long lost information that an old library card catalogue could not. This posting relates to something truly unique that I stumbled on in JSTOR. Usually the JSTOR database is focused on 20th century and later, in contrast to Google Books (which is now an important though patchy source of non-copyright journals). Pre-1900 periodicals don't put bread upon the table of JSTOR. So much to my surprise a random search for Antiochene incriptions in JSTOR recently threw up a journal article from 1860. To be exact this was the Journal of the American Oriental Society Vol. 6 (1858-1860) pp 550-555. This little gem of an article was a report by James Hadley (the Professor of Greek at Yale) on an inscription that a certain Rev Homer B. Morgan, a missionary in Syria had literally stumbled upon at Daphne. The appropriately named reverend gentleman had discovered an inscription on a limestone slab of 17*30 inches. After removing various encrustations he uncovered what is probably the most extensive inscription that has come out of the area. And yet this inscription I have never seen mentioned elsewhere. According to a footnote, the stone was eventually acquired for the Society, but an inquiry on my part drew a blank from the powers that be. Its whereabouts would certainly be interesting to ascertain. It probably moulders in some basement at Yale, if it has even stood the test of time in the groves of academe. 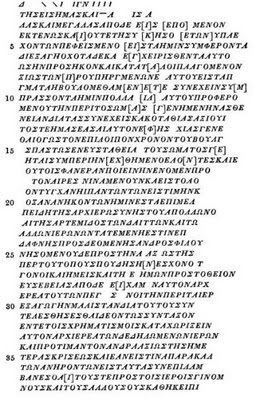 The letters of the last line date the inscription as being from the 14th of Dius in the year 124 (of the Seleucid calendar) which Hadley equates to autumn of 189 BC.
" [A. B.] having, with strenuous effort, made very clear demonstrations, many and great, of his [fidelity and devotion] to us and to the public service, and having spared neither his life nor his property for our interests, but having managed also as was proper the things put into his hands, and, for the rest, conducting himself in a manner worthy of the services before rendered by him to the public interests-him we desired, indeed, still longer to keep employed, co-operating with us in many things. But upon his bringing forward [as ground of excuse] his feebleness of body, the result of his continued hardships [in the public service], and requesting that we would permit him to be at rest, that for the remaining time of his life he may be, without interruption, in good health of body-we complied [with the request], desiring in this also to make manifest the preference which we have for him. So, then, that for the fiture also he may enjoy all things which pertain to honor and reputation, shall be our care. Since now-as the high-priesthood of Apollo and Artemis, over the [holy] carvers and the other sacred offices of which the consecrated grounds are at Daphne, requires a man of friendly feeling, but one'who will be able to preside in a manner worthy of the zeal for the place which our ancestors had and we [now have], and [worthy] of the veneration on our part for the divinity since now we have appointed him high-priest, with charge over these things, being persuaded that through him, above all others, the management belonging to the sacred offices would be conducted as it ought to be-[therefore] take order to inscribe him in the records as high-priest over the sacred offices set forth above, and to honor the man in a way worthy of our judgment, and, if he call to any duties, of such as appertain to these things, that those who are engaged in the sacred rites should co-operate with him, and should bring together on the spot the rest who ought to render service, charging them to obey in whatsoever he may write or order-and, farther, to have the copy of this letter inscribed on pillars, and to set it up in the most conspicuous places." Now if we consider Mommsen's cruel but true observation on the quality of Antiochene inscriptions, then this certainly does not add enormously to the quantity but does made a quantum leap in quality. This inscription is nothing less than a tribute to the new high priest, it is an extensive and a quality addition to the rarefied (and hitherto low-rent) corpus of Antiochene inscriptions. Alas, the estimable Reverend also discovered two other stones nearby with fragmentary inscriptions, one of which began with the word ΗΒΟΥΛΗ (the council) in "large handsome letters". This then went on for half a dozen lines of ten to twelve letters each line, unfortunately he did not record these (or at least not in Hadley's recounting). Morgan felt that this inscription ran off onto another stone than would have stood at its side. The whole area was littered with column drums (some fluted) and other miscellaneous architectural pieces of a superior kind of structure. In light of the inscription's subject matter, one is tempted to say that he had stumbled upon the site of the Temple of Apollo precinct, the site of which was never uncovered by the Princeton team in the 1930s. Antioch was a a city of varied water features. The springs of Daphne and the intricate aqueduct system provided an abundant source of supply for this most Roman form of street architecture. Nominally they were supposed to shrines to the Nymphs but in reality were soothing and diverting gathering spots which allowed benefactors to be immortalised. Libanius made much of a centrally-located Nymphaeum (attributed to Tiberius) that subsequent scholars have attempted to place at the junction of the Colonnaded Street and a major avenue heading off towards the Island and its Palace district. The hunt by the Princeton Expedition for this site proved fruitless. In their estimation this junction and its water feature were somewhere in the vicinity of the "Forum of Valens" and the Parmenios crossing of the Colonnaded Street. In the disappointment at not finding this edifice, little attention was given to an interesting discovery by Jean Lassus at a secondary site only a few blocks north of where the Forum of Valens was believed to lie. While Lassus had a focus on the main street, in this one exception he diverted off slightly towards the Grotto of Peter and the Charonion into a parallel thoroughfare. 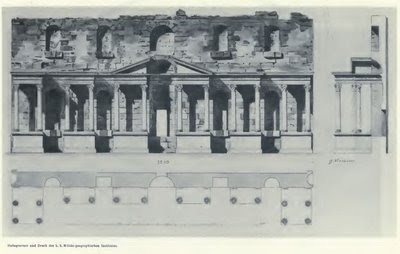 The site he worked with was made difficult because he was not allowed to excavate under a road that ran perpendicular to the Colonnaded Street and thus it cut through the dig and restricted operations. Lassus wrote up his 1930s discovery in the 1970s when the belated last volume of the dig reports was published. By then most of the other participants were long gone. What he had discovered was a Nymphaeum, not monumental as they had hoped but nevertheless sizable. It dated, in his opinion from the time of Justinian when major renovations took place after the devastating earthquakes of the 520s A.D. Thus this was 150 years after Libanius had indulged his rhapsodies on the much larger Nymphaeum. Lassus's discovery consisted of a large courtyard which was 21.75 metres wide and 11.50 metres across. Along the long side ran the Nymphaeum which occupied the whole long side except for 1.5 metre passages at either end. The plan of this structure is shown below. The structure consisted of an ornamental wall with rounded and rectangular niches (for statuary?) and a long basin in front of the wall. The basin was one metre wide and 70 centimetres deep and ran the length of the wall (i.e. nearly 20 metres). The wall was made of brick and had at the bottom a footing of 1.25 metres in height that consisted of low pilasters. On top of this was another wall, slightly less thick in which the niches stood. The total height was unknown due to the wall having been demolished above 1.34 metres. Water arrived at the basin via a channel along the face of the wall. Water came into the structure by piping feeding from the west and then ran out of the basin into other piping where it ran away into the city drainage system. The Nymphaeum was quite a delicate structure being less than a metre thick in places. It was protected behind by a very significant wall, which Lassus muses may have been dated back as far as the earthquake of 115 A.D. which was designed to protect against downward slippage of the hillside behind it. There were mosaics on the pavement of the courtyard and Lassus indicates that the side walls of the courtyard (while of brick) showed signs of marble cladding at some earlier time. Lassus does not speculate on what this structure may have been. A mere shady spot away from the city bustle? Part of a larger complex, baths for example? It is doubtful that it is a private retreat on such a large scale. So, in reality, the excavators did find a Nymphaeum, monumental maybe not, but certainly a structure of quality and subtlety, no less than we would expect for the rarefied denizens of Antioch's better parts... Recently a thought struck me while reading Susann Lusnia's excellent study of the Septizodium (in the AJA) in Rome. This structure was initially (and still is in some quarters) believed to be a nymphaeum but she makes a case that a septizodium is actually a form of fountain that is dedicated not to the nymphs but to the seven planetary bodies. We went back to the cross-section (shown below) of the structure under discussion here and noted possibly six niches but the crucial middle part of the structure is mere conjecture since it was unexcavated under the roadway. Thus I would not entirely discount that there may have been seven niches rather than six and the fountain may have been a septizodium. This possibility should not be dismissed out of hand as we have noted elsewhere that astrology and planets figured in both the thinking, and some of the structures, of the Antiochenes. The Aspendos version has a similar array of multishaped niches and measures about 50% longer (it was 33.5m by 15m in height) than the subject of this commentary. It is tempting to imagine that the Lesser Nymphaeum was a scaled down version of the Aspendos model. "From four arched vaults linked to one another in rectangular formation, as though from the navel, four pairs of colonnades extend to each point of the compass - as in the statue of the four-handed Apollo. Of these, three of the colonnades reach the circumference of the wall, while the fourth is shorter. Yet the shorter it is, the more beautiful it is, for it, as it were, goes to meet the palace quarter which starts nearby, and serves as a gateway to it." The "arched vaults" is a structure known as the Tetrapylon of the Elephants. It was basically a four-way triumphal arch placed at a street junction. While not the most common of arch types in the Roman Empire, other examples are known, a particularly well-preserved one (see photo below) being at Beroea (Aleppo). 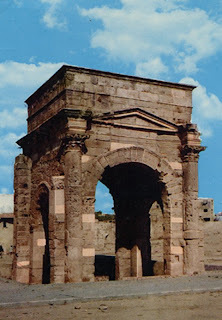 The Tetrapylon of the Elephants has also come down through history in fame as being the site at which Julian the Apostate pinned up his satirical chiding of the Antiochenes called the Misopogon (or beard-hater). This structure may take its name from having a sculpture on elephants pulling a quadriga upon it or at least a carving thereof on side panels. This elephant quadriga motif can be found on some Roman coins.